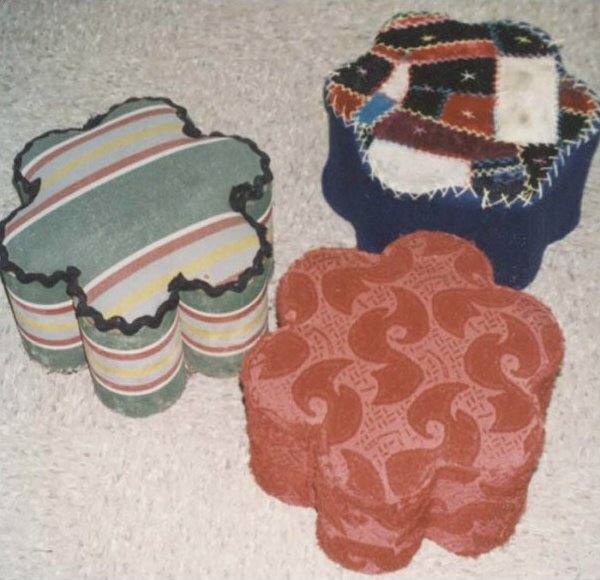 Ask for photos of all in the collection, Pennsylvania origin footstools, made from 7 cans. Typically oatmeal, food, or nail cans were used to make this scalloped shape. There are 6 cans surrounding a seventh in the middle, then the group is typically upholstered with fabric. We have all kinds of late 19th early 20th c fabric covered ones in inventory, including some covered with pieced velvet crazy quiltintg, and some that are covered in a hooked rug surface. Ask. have never opened then, it has been said this is where folks kept their $ $ , so who knows what you might find inside!